Supplements from bodykind are only sourced from premium quality brands. Our extensive range of supplements offer optimum nutrition to support healthy lifestyles. At bodykind we offer a vast selection of high quality health and wellbeing products for you and your family. Take a look at our Healthy Food and Test Kits today. Our beauty range is 100% natural and organic. Explore our face care, sun care and specialist baby skincare products today for beauty - the natural way. With our range of healthy food and drinks, including Nuts and Seeds, Oils and Butters and Honeys and Spreads, you can ensure your diet is as healthy as possible. At bodykind we offer a selection of high quality health products for your house and home. From light therapy and air purifiers to aromatherapy, juicers and more! In stock -This product will ship today if ordered within the next 12 hours and 41 minutes. Mild and hypoallergenic, fragrance free, nut free and gluten free to provide immediate moisture relief for dry, sensitive and itchy scalps. A delicate infusion of certified organic rosehip oil, organic shea butter, jojoba oil and oat extract to soothe, nourish and comfort sensitive scalps. Aqua (Water), Cetearyl Alcohol*, Glycerin*, Sorbitol*, Behentrimonium Methosulfate*, Rosa Canina (Rosehip) Seed Extract+, Butyrospermum Parkii (Shea) Butter+, Hydrolyzed Oats*, Lecithin*#, Simmondsia Chinensis (Jojoba) Seed Oil*, Glyceryl Laurate*, Panthenol (Provit B5), Persea Gratissima (Avocado) Oil+, Rosmarinus Officinalis (Rosemary) Leaf Extract*, Sodium Gluconate*, Citric Acid*, Potassium Sorbate. 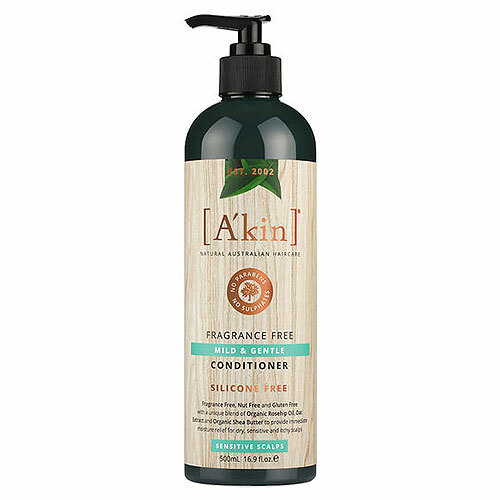 After using your favourite A`kin shampoo, massage conditioner gently into the scalp and hair. Leave for 1-2 minutes and rinse thoroughly. Style as usual. Below are reviews of A kin Mild & Gentle Fragrance Free Conditioner - 500ml by bodykind customers. If you have tried this product we'd love to hear what you think so please leave a review. My daughter suffers with flare ups of Psoriasis on the back of her head, this conditioner along with the shampoo is very gentle and works well without aggravating her condition. Below are questions that bodykind customers have asked us about this product. If you want to know more about this product please don't hesitate to ask us a question. Our beauty products are free from Parabens, Petrochemicals, Mineral Oils, Phthalates, SLS, Pesticides and all other nasty chemicals. Customers who purchased this product also purchased the following. Have you seen this product cheaper elsewhere? Why not take advantage of our price match promise. Please read the terms and conditions before submitting a price match. © Copyright 2004–2019 bodykind Ltd. bodykind is a registered trademark of bodykind Limited - All rights reserved. bodykind is a limited company registered in England & Wales. Company Number: 05224515 VAT no: GB851929107 Registered office: Trimble House, 9 Bold Street, Warrington, WA1 1DN, United Kingdom.